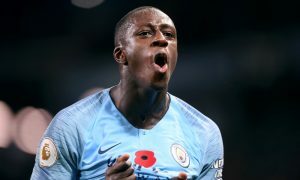 First it was the knee, then the ankle, but it turns out the problem sidelining left-back Benjamin Mendy at Manchester City is in his foot. Last week, Pep said Mendy’s problem was knee-related, then today said the injury was in the ankle or foot area, creating some confusion. “Mendy is injured. He has a problem with the bone in his ankle, foot,” Guardiola said at his pre-Cardiff presser on Friday afternoon. According to several reports, City have now confirmed the exact injury, and it is a bruised metatarsal on Mendy’s left foot. The injury is described as minor although has kept the 24-year-old out of City’s last two games, and will again sideline him tomorrow against Cardiff. No exact return date is known yet for the flying Frenchman, who already has four assists in the Premier League this season, but his return should not be far off.